Today, the world is ruled by communication network. Look at social networking sites, communities, and all kind of online interaction. Look at how the massive communication flows are overwhelmingly annex our life spaces. Everyone has their own gadget for this. Cell phones, tablets, PCs, and who knows whatever types of gadget will flood our life. In organizations, communication network is not a new thing. The earliest generation of management information system (MIS) had shown how the future will rely significantly on how we manage information and communication network. It used to be a network where database availability and exchange is the main feature. Now, we exchange more types of information; from statistical data to rumors are available in the network. Information and communication system used to be one of the support system. Now, we see how corporate communication network is the blood circulation system of any organization. It’s necessity is undeniable, and the ability to manage it is quintessential. Managing a corporate communication networks is basically managing the organization’s network of mind. Today, corporate communication is not just about public relation or corporate branding or any other outward communication. It is also about communicating inward. Both dimensions, inward and outward, are equally important. However, each requires different approach and strategies. The outward dimension is build through publicity and corporate branding, in which public relation, stakeholder engagement and media strategies are prerequisites. The inward dimension involves employee engagement and strategic alignment initiatives play the central role. Each of those is different than the others. Outward corporate communication is about influencing the collective mind of the external public. We can have a magnificent strategy to effectively build publicity and fame, and we will harvest impressive response from public, and particularly our external stakeholders. But this does not necessarily guarantee that we will have good impression within the organization. Outward communication is about creating and managing public perception about our organization. It’s an external strategy to gain external results. This is where the medium is the message. The way the organization present itself determine how external stakeholders and the public in general perceive and favor the organization. It’s more about how to build the impression in the public mind than the substance of the message. Therefore, using advertising or celebrity’s endorsement may serve well. On the other hand, inward communication refers to a different approach in influencing the collective mind within the organization itself. It’s about engaging all parts of the organization, through which all of them will align and build a synergy. In comparison to outward communication, inward communication is not merely about making impression. It’s about how to make corporate vision and mission statement manifest in collective actions. We can’t rely to celebrity or ads for this. Instead, we need strong and clear leadership in all levels. Using posters, banners or printed vision and mission statements all over the factory sites may less effective than morning greetings and informal chats between CEO and employees. This includes those communication process through social networks and hand-held gadgets. In fact, many cases show that informal and direct communication through various occasions create better corporate communications than ads campaign alone. Corporate communication is a systemic effort, a backbone of organizational culture and transformation process. It decides how well the organization’s internal system performs, and how effective the organization is in showcasing its value to the outside world. And…. 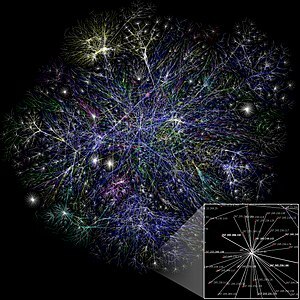 in this hectic and complex world of information network, it requires a state-of-the art strategy. I also think it is related with the creation of corporate atmosphere and corporate culture. After all, its all about the atmosphere! The right way to communicate and engage will secure the conducive atmosphere, so the people in the organization can thrive in the work process, and actualize their full potential as a human being. This is a very important point in leadership: create the atmosphere of authenticity and creativity. You nail it right on the head, my friend! Yes, internal corporate communication is about creating atmosphere and culture of the organization. That’s why I mentioned key elements such as alignment, collective mind, engagement and collective action. And as you said, this definitely needs a specially designed strategy to be effective. It should be state-of-the-art approach and strategy. Ini pertanyaan bagus, Kandy. Saya mau mengkritisi saja teman-teman dari multi level marketing yang berkata tentang big bang. Sejak dulu jaman saya kuliah, selalu akan dikatakan ada big bang tapi juga tidak terjadi. Saya setuju bahwa kalau pun ada big bang, yang terjadi adalah bigbang network berupa online community dan komunitas social enterpreneurship. Bukan bisnis multilevel. Bahkan, social enterprise di berbagai daerah justru sudah menghasilkan banyak peningkatan kesejahteraan di berbagai wilayah di dunia, termasuk di Indonesia. Lihat saja ecovillage tourism di Bali, atau rural partnership dan social entreprise peternakan berbasis masyarakat desa di Jawa Barat, Jawa Tengah dan Jawa Timur. Lihat juga komunitas-komunitas bisnis kreatif di Jogja. Atau komunitas pemusik Taman Bungkul Surabaya. Itu semua kan network, dan jelas bukan bisnis multilevel. Reading this post, I think this is one of fundamental Collaborative Business Operation. Nowadays, I see so many business associates and their members are small business companies. This is good for our national economic sustainable growth. Yes, I agree. Collaborative business operation is increasingly popular, either in form of strategic partnership or in the form of social entrepreneurship. It’s a promising development for Indonesia’s sustainable growth.